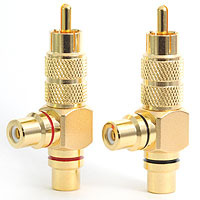 RCA Splitter - Right Angle Phono Plug to Two Sockets Y Adapter A heavy grade RCA phono splitter used to split or combine audio inputs or outputs. It is gold plated and has a split centre pin for a reliable contact. Supplied in pairs with red and black colour coding bands. Item code: PHOSPL01. 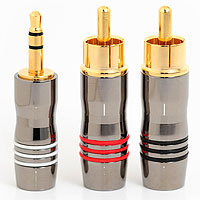 1 Stereo 3.5mm Mini Jack Plug + 2 RCA Phono Plugs A set of three gold plated audio connectors, consisting of one 3.5mm stereo jack plug plus two RCA phono plugs. Item code: PHOJAC01. 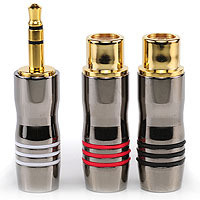 1 Stereo 3.5mm Mini Jack Plug + 2 RCA Phono Plugs A set of three gold plated audio connectors, consisting of two phono RCA sockets plus one 3.5mm stereo jack plug. Item code: PHOJAC02.